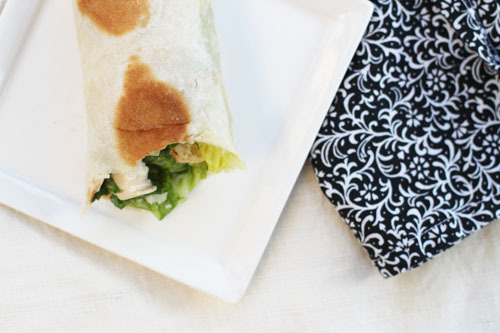 I have a new favorite go-to meal that happens to be perfect for summer: Chicken Caesar Wraps! They’re easy, the ingredient list is short and compiled of items I normally have on hand, and I’m always surprised at just how tasty they are! The other fun thing is you can make them super, duper easy or gourmet them up a bit, using more homemade ingredients. No matter how you make them, they are delicious! 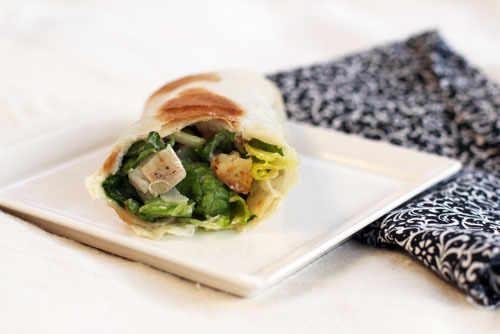 I wasn’t really planning to do a post about chicken caesar wraps, but when we were eating them for dinner last night, Anna said, “Mom, you should take a picture of these for your blog!” She’s always looking out for the blog! Lay out your tortilla/wrap, pile on all the other ingredients, fold like a burrito and eat! I like to spread some dressing on the tortilla before piling on the ingredients and then topping everything with more dressing before wrapping it all up! These sound great and I am always forget how many other things can be wrapped in up a tortilla besides the normal taco/burrito stuff. chicken casear salad has been my go-to for a few weeks as well, but I don’t wrap it. I should!! thanks! I make my own croutons, because I make my own bread, so all the ends or stale bits get cubed, lightly oiled, herbed, but then I toast mine in the oven – so they DO get super crunchy like the store bought ones. whatever we don’t use up in a week or so gets smashed up into breadcrumbs for another use. this was my go-to dinner at the fast food place on campus in college. my friend manned the chicken caesar salad/wrap booth….love these and i haven’t had them in years!! BTW, are those the uncooked Costco tortillas? To die for. We always have them in our fridge to use for everything!